Wildly versatile pianist, tenor, conductor, bassoonist, stage director, composer, voice professor, and arranger Robert Frankenberry is presented in recital at St. Peter's Church in the Village by longtime music series in residence PRISM Projects. Along with works by David Del Tredici, Roger Zahab, and Eric Moe, Frankenberry will perform Hagen's Piano Variations, and the world premiere of a new work by Michael Laster. Robert Frankenberry leads a multi‐faceted career as a vocalist, pianist, educator, actor, and conductor. His credits in musical direction cover the span of opera, including Sweeney Todd (Weathervane Theatre), The Tales of Hoffmann (D’Angelo Opera Theatre), Cosi fan Tutte (DaCorneto Opera), Monteverdi’s 8th Book of Madrigals (Opera Theater of Pittsburgh), Robert X. Rodriguez’ Frida (microscopic opera), and the staged premiere of Daron Hagen’s Vera of Las Vegas (Center for Contemporary Opera). During the 2013-2014 season, he served as Associate Music director for Glass/Ginsberg’s Hydrogen Jukebox and Music Director for the premiere of Daron Hagen’s I Hear America Singing at Skylight Musical Theatre, and returned in the Spring of 2015 as Music Director/Alberich/Hunding/Mime/Hagen for the premiere of The Skylight Ring. This past summer, he conducted the premiere of Gilda Lyons’ and Tammy Ryan’s opera, A New Kind of Fallout, based on the life and work of Rachel Carson, for Opera Theater of Pittsburgh’s SummerFest. On stage, he has performed a wide range of roles, including Mozart (Amadeus), John Adams (1776), Bacchus (Ariadne auf Naxos), Yorick (Her Hamlet), Alfredo (La Traviata), The Duke of Mantua (Rigoletto), Count Carl-Magnus (A Little Night Music), Radames (Aida), Rodolfo (La Boheme), and the title roles in Don Carlo, The Tales of Hoffmann, Faust, and Willy Wonka. As a member of Millennial Arts Productions’ Baroque Opera Institute, he received specialized training in Baroque gesture and vocal performance style, and appeared in a fully-staged off-broadway production of Handel’s Messiah. As Music Director for Opera Theater of Pittsburgh/OT SummerFest, he has garnered critical praise for his collaborations with Jonathan Eaton for their “reimaginations” of Gluck’s Orpheus and Eurydice and Carmen—The Gypsy (re-orchestrated for folk ensmble); a chamber reorchestration for the North American staged premiere of Montemezzi’s L’Incantesimo; and The Tales of Hoffmann—Retold, which featured music from ETA Hoffmann’s Undine recomposed by Frankenberry and incorporated into the production. Their production of Ricky Ian Gordon’s Orpheus and Euridice, which was performed on the lake in the Allegheny Cemetery, was chosen as one of the Pittsburgh region’s Top 10 cultural events for 2011 by the Tribune-Review staff. In 2013, they commissioned the “Fallingwater” version of Daron Hagen’s Shining Brow, which they premiered on and in Frank Lloyd Wright’s Fallingwater and subsequently produced at the Twentieth Century Club in Pittsburgh. Since the inaugural season of the Opera Theater SummerFest Young Artist Program, Frankenberry has coordinated the commissioning of and led the premieres of the Night Caps, Night Caps International, and Happy Hour projects, designed to feature young artists and provide new avenues for audience and community engagement, comprising new works by Daron Hagen (George Washington Suite), Gilda Lyons (Moonlight Suite), Roger Zahab (Happy Hour, Presidential Suite, Penthouse Suite), Eric Moe (Valkyrie Suite), Alberto Demestres (Honeymoon Suite), Monic Cecconi-Bottella (French Suite), Yanwa Guo (Chinese Suite), Dwayne Fulton (Gospel Suite, Bridal Suite), and himself (Checking In/Checking Out). He is currently at work on an official chamber orchestra reduction of Richard Strauss’ Die Schweigsame Frau for the 2016 SummerFest season. 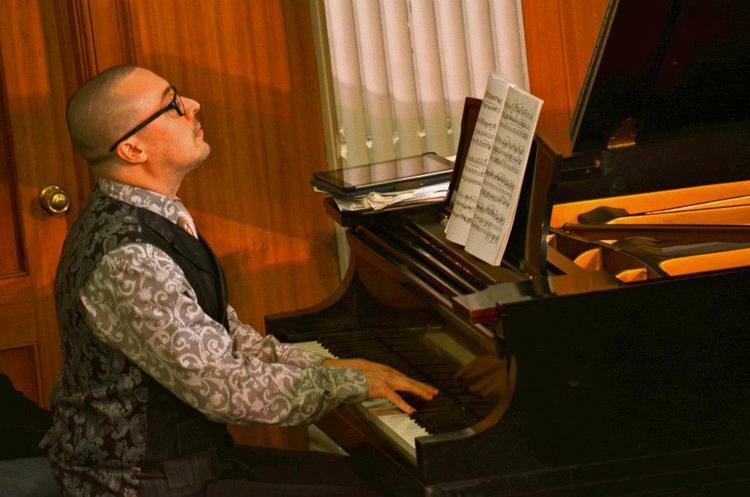 At the piano, Frankenberry performs both traditional classical and contemporary chamber music, and is a member of IonSound, Chrysalis, the Music On the Edge Chamber Ensemble, Trio AnimeBOP, the Phoenix Players, and entelechron. He holds a BM in Piano Performance from Mercyhurst College and an MM in Voice Performance from Carnegie Mellon University. He has held faculty and staff positions at Mercyhurst College, The University of Akron, Chatham University, and Carnegie Mellon University, and is a regular guest presenter at the Vermont College of Fine Arts for their MFA in Composition. Learn more about Frankenberry here. The Piano Variations were commissioned by Ralph Berkowitz, longtime accompanist of Piatigorsky and former Dean of the Berkshire Music Center at Tanglewood. They were composed slowly, over a period of two years. Described by Hagen's publisher as "by turns driving, mysterious, vivacious and visionary, the eight variations in Piano Variations exploit the range and sonority of the piano with expertise and understanding." Hagen's use of dissonance is higher than is customary for him in this introspective, technically challenging, and intellectually uncompromising piece. The first three variations were written in Austin, Texas, during the first production there of Hagen's opera Bandanna. Variations 4-6 were composed at Yaddo, and the last two variations were completed in New York City on 6 November 2002. The composer has inscribed them "to Ralph Berkowitz, on his 90th birthday." The variations were premiered by Marc Peloquin in June 2005 at the Bloomingdale School of Music in New York City and subsequently toured by Rpbert Frankenberry as part of the solo recital "Copland and Company," which paired the variations with Copland's, along with other piano works by Blitzstein and Bernstein, among others.